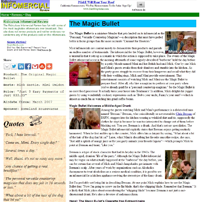 After 14 years online, this website has a brand new design and the name has officially been changed from the “Ridiculous Infomercial Review” to Infomercial Hell. 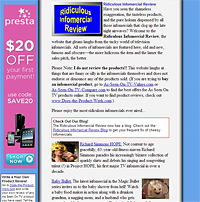 All the old infomercial reviews and blog posts are still here and we will continue to skewer ridiculous infomercials and the absurd “As Seen On TV” products they sell. But the new design, in addition to being more attractive, will make it easier to find pages using the search boxes located at the upper right of the page and in the left column. You can still browse through all the blog posts on the Browse By Date and Browse By Category pages but now there are two new pages: Fan Favorites, which are those posts and reviews readers have enjoyed the most, and Paul’s Picks, which are the ones I have liked the most. Those of you who complained about the old design please send me your name and address so I can mail a bill for your portion of what it cost me to pay for a graphic designer, Web designer, and Web developer. And if anyone doesn’t like the new design, just wait 14 years and I might consider changing it. If you want to keep up with all the latest posts on Infomercial Hell, the best option is still to subscribe to our RSS Feed in your RSS reader. With the site update, the URL of the feed was changed to http://www.infomercial-hell.com/feed/ Most RSS readers will automatically update it; otherwise update it yourself with the new URL. If you would ratther get an email announcement every time we publish a new blog post, you can subscribe to our email list. The list is nothing fancy; you simply receive a link whenever the latest blog post is up. I hope these changes will make it slightly less embarrassing to tell your friends about Infomercial Hell! Looks great. Keep up with the good work so we can have a good laugh. Like the new look. Easier to navigate. Love the new layout. Now I’m gonna drink my Mickerini cocktail with a side of Hazeltini!